Periodically I go through my baking supplies to find expired items. It also helps reacquaint me with lesser used ingredients. A recent search uncovered black cocoa powder from my Cream-Filled Mini Cakes. This cocoa is a Dutch process cocoa powder which is “washed with a potassium carbonate solution that neutralizes cocoa’s acidity to a pH of 7.” The black version is bittersweet and is alkalized to a pH of 8. 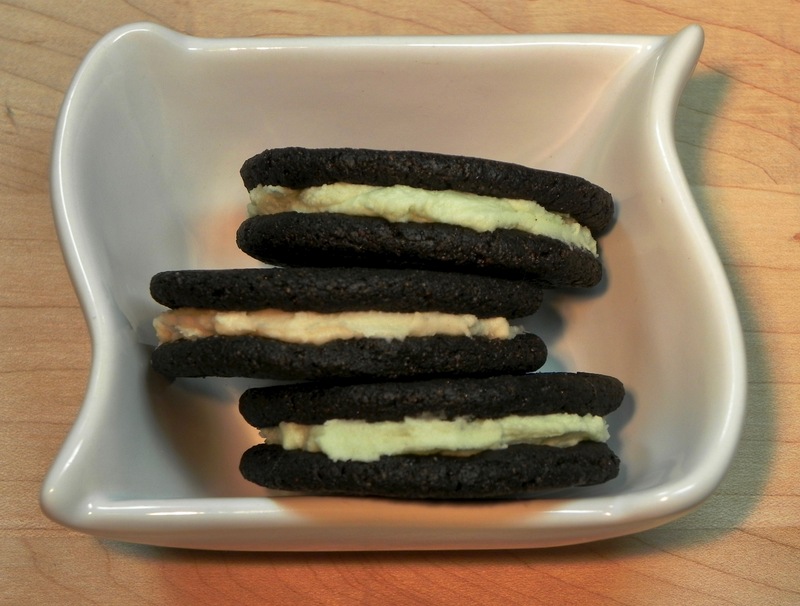 It is also the signature taste of Oreo Cookies, so I went into the kitchen to make a version of that iconic treat. I found a chocolate cookie recipe that I veganized by substituting with non-dairy equivalents. I was concerned about using my special cocoa powder because Dutched cocoas, especially the heavily Dutched black cocoa, are used a little differently. “Since Dutch process cocoa isn’t acidic, it doesn’t react with alkaline leaveners like baking soda to produce carbon dioxide. That’s why recipes that use Dutch process cocoa are usually leavened by baking powder, which has a neutral pH.” When I realized that you want an Oreo-type cookie flatter to make cookie sandwiches, I stuck with baking soda as my leavener and it worked beautifully. To finish my cookie sandwich, I dug up a recipe for flavored cookie fillings. I took the standard vanilla type and added coffee extract which added deeper flavor and a slight hue. 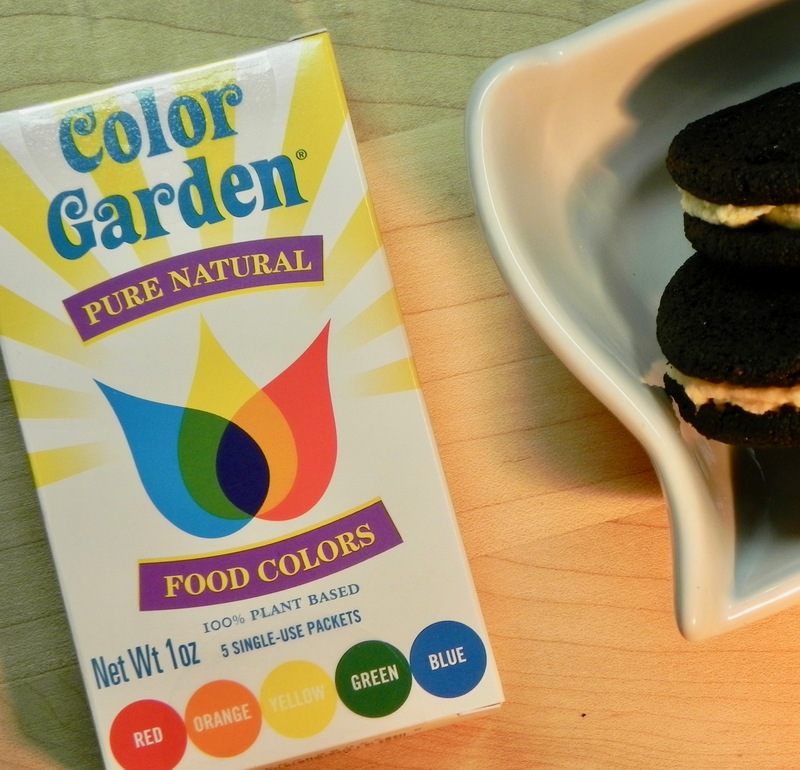 I also thought that mint sounded tasty and was the perfect backdrop for my Color Garden plant-based food colors. Their food coloring isn’t as intense as artificial ones so I used more. If using another brand, use a drop at a time to get your shade. I liked my filling pale green. In a stand mixer, cream together margarine, sugars, and vanilla until light, about 2 minutes. In a medium bowl, whisk together flour, cocoa powders, soda and salt. Add dry ingredients to margarine mixture and mix just to combine. Add milk, in a few segments, and mix just to combine. Form dough into two 1 1/2-inch-thick logs. Wrap in plastic wrap and refrigerate for several hours. To bake: preheat oven to 350F and line 2 baking sheets with parchment paper. Slice each log of dough into 1/8-inch-thick coins. Arrange on baking sheets with 1 1/2 inches between cookies. Bake for 12-14 minutes, rotating trays in the middle of baking time. Bake for another 2 minutes or until they are dry looking and firm. Cool on baking sheets on wire racks for 5 minutes, then slide cookies onto racks to finish cooling. Makes 4 dozen cookies, or use the filling below to make cookie sandwiches. Combine margarine, powdered sugar, and salt in the bowl of a stand mixer fitted with a paddle attachment. Mix on low speed until powdered sugar is moistened, then turn to medium speed and mix for 1-2 minutes, until it has a lighter color and fluffy texture. Don’t over-mix. It needs to be somewhat firm. Divide into two portions to make two different flavors. For Coffee Latte: add vanilla bean paste and coffee extract. For Mint: add mint extract and green food coloring.